We all know how hard Boston and New England fans can be. I can sometimes fall into that category but something I think we need to do better as a group is to stick it out for our players when they are not at their best. Chad OchoCinco is already being criticized for a slow start at training camp but let’s think about this. The lockout basically took the players out of football for 6 months. Even Tom Brady is rusty and we all know that when he puts his time in he can be stellar. As fans we should want all our players to succeed. We are more than familiar with challenging personalities like Randy Moss and Manny Ramirez but that should teach us a lesson. Both Moss and Ramirez could have taken their extraordinary talents much farther if they had a better head game. They let the press and circumstances around them affect their performance and their work. Not everyone deals with the spotlight the same way so we should always try to be positive until at the very least we are proven wrong. The CSNNE report I am including below shows how sports commentators (in this case Mike Giardi) whether on purpose or just as part of their nature want to criticize. At least in this report Tommy Kearn is balancing out the negativity. 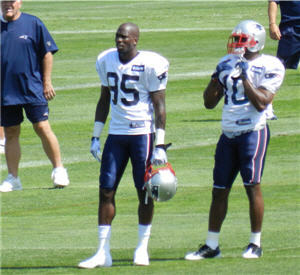 In the video footage you can also see that OchoCinco acknowledges that he is not where he needs to be. As for this fan I will wait for a while before I make any judgement calls on any of the Patriots. Due to the lockout it will take more time to see how all of the new acquisitions and our old heroes perform. I do know that when we saw them all at training camp on a 90+ day they were giving it all they had.